Explaining AF in a short blog is impossible. Massively thick books have been written, and week long symposium are routinely given on AF . That said, here is my best impression of Sal Khan, who can explain nearly anything in a 10 min video. When in AF, the atria are beating (quivering) at 300-500 beats per min. The atria do not pump blood to the body; the ventricle accomplishes this. Ventricular rate (pulse rate) is determined by how fast the AV node conducts the AF impulses from north to south. The AV node acts as a road between the atria and ventricle. It has a certain refractory period which means it can conduct electrical impulses only so fast. The AV node’s speed of conduction varies greatly amongst individuals, and thus, so does the ventricular rate during AF. The inter-person variability of AV conduction is probably in great part genetically determined, whereas the intra-person variability is related to adrenaline levels. The AV node is richly innervated by the autonomic nervous nervous system (the involuntary nervous system.) So when adrenaline levels are higher, like with exertion, the conduction velocity is increased and likewise at times of low adrenaline levels, like at rest, the rate of conduction slows. In general, pulse rates (ventricular rates) are higher with AF, but not always. For instance a person with AV block would transmit none of the atrial signals and the heart rate would be very low. Patients with cardiovascular fitness–and high vagal (anti-adrenaline) tone–might have slow AV node velocities. In this case the atrial fib signals would traverse the AV node at modest rates resulting in only modestly irregular heart rates. This image is from a dual chamber defibrillator recording. The atrial and ventricular leads record intra-cardiac signals which can be stored and displayed. Neat. The atrial fib signals are irregular and at a rate of over 400 beats per minute. The second row of signals are from a lead in the ventricle. As can be seen, the ventricular rate is but a fraction of the atrial rate. This fraction is determined by the speed of AV nodal conduction. 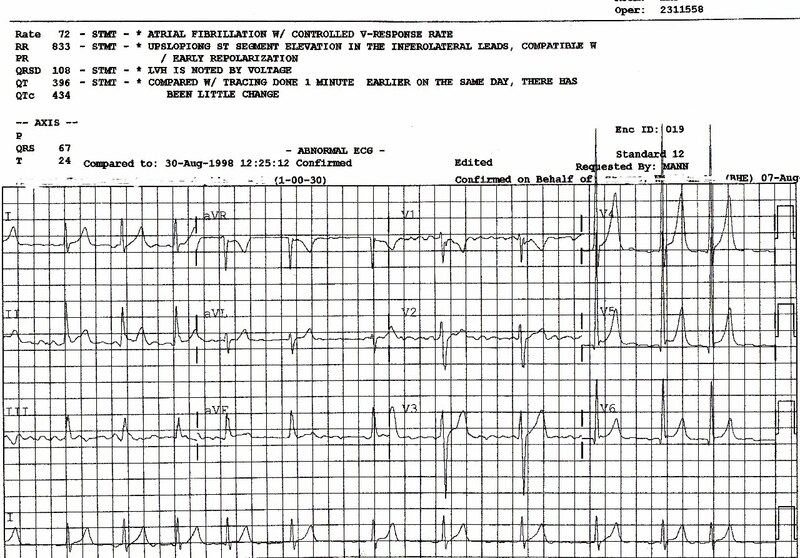 This ECG was recording during my AF episode. The atria are fibrillating, but the pulse rate is in the 70s, albeit with the characteristic irregularly irregular pattern. The rapid atrial rates in AF cause the atrial muscle to quiver rather than contract. Lack of contraction can cause blood to pool. This pooling of blood increases the risk of clotting, and therefore patients with AF are generally more susceptible to stroke-causing clots. The story on stroke in AF is a very long chapter. Suffice it to say, AF patients vary in their stroke risk, with the young patient without any co-morbid conditions being at very low risk, and conversely, the very old patient with multiple medical problems being at high risk. Most AF stroke risk falls somewhere in between. That’s where doctoring comes in. More often than not, AF patients have excessive tachycardia. The heart is a muscle, and like any other muscle, excessive contraction will gradually weaken the heart. This gradual decline in cardiac contractile force enhances the risk of congestive heart failure. The good news is that AF therapy can both prevent and reverse CHF. Again, good doctoring can make a huge difference. Cardiac symptoms of AF occur because of irregularity of the rhythm, increased heart rate, or a combination of both. In general, AF reduces the cardiac output 20-30 percent. This reduction is perceived with great individual variability. Not a small number–let’s say a third–of AF patients report no symptoms. How one AF patient can be incapacitated, while the next is completely asymptomatic is a mystery to all. 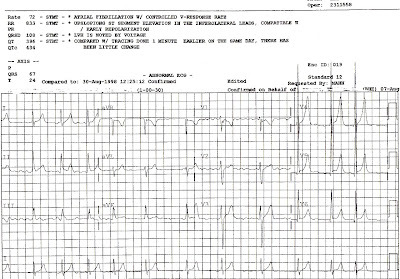 Symptoms of AF do not always parallel the objectively measured parameters of heart function. Some patients have marked reduction in ejection fraction, but no symptoms, whereas others have normal EFs, but terrible symptoms. It is a mystery. This post is not meant to be comprehensive. Just a teaser, maybe a stimulus to learn more. A good analogy I read for the timing of cardiac repolarization was after you flush a toilet. The time during which another depolarization front cannot pass is analogous to the time the bowl takes to refill. Thanks for this. Very well written and informative. Also a physician (speed skater/cylist) with recurrent paroxysmal afib. Just cardioverted after my second episode exactly 5 years after the first. Interestingly the first conversion was done with flecainide and the second with electricity. The second also included anticoagulation (enoxaparin/coumadin) for a month after a transesophageal echo to r/o potential emboli. Quite an annoying problem especially the large amount of information available that doesn't seem amenable to analysis. For example, atrial chamber sizes and ventricular wall thickness – what do they mean when they are shown to be increased in competitive cyclists? There is also no good guidance on resuming training – how fast and how intense after cardioversion. The advice I have so far on ablation is that the results are not as good as most people think. Thank you for this information. The best attempt yet to explain A.F. in terms we can all understand. I am a novice but do understand your description of what is going on in the A.F. heart.